Epson will exhibit a wide range of applications and equipment that will demonstrate the versatility, quality and performance of its latest generation of digital inkjet technology. For the very first time at FESPA, the Monna Lisa industrial textile press will be a key feature that will demonstrate to users that there is a migration path for striving businesses. 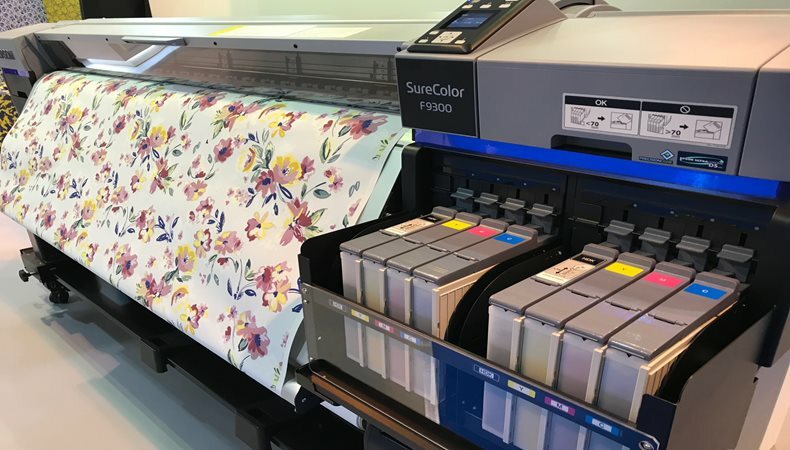 Epson will also demonstrate their latest textile printers which include the SureColor SC-F9300 dye sublimation printer, the SureColor SC-F2100 Direct To Garment printer and the SureColor SC-F6200. Epson’s stand will feature a haute couture womenswear collection by Richard Quinn. Quinn won the inaugural Queen Elizabeth II Award for British Design which was presented by the Monarch at London Fashion Week. All items were printed on SureColor SC-F Series printers. Epson will demonstrate an insight into future design with the décor work from Birmingham City University School of Textiles and Fashion. The Epson-BCU project tests students to produce work to a set brief. Four students will be chosen and invited to attend FESPA 2018 to view their work on display. Additional products will be displayed and produced that will include giftware, décor, signage, photography, proofing and backlit products. Two models from the SureColor SC-S range will be displayed, the SC-80600 and the SC-60600 as well as the SureColor SC-P photographic quality printer.